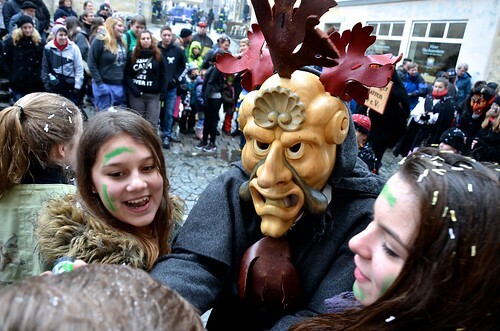 Today is Tübingen's Fasnetsumzug. It is kin to Carnival. 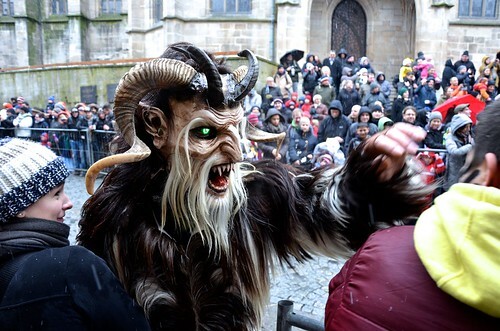 In Tübingen, there's a parade of bears, badgers, witches, soldiers, and ugly spirits, as above, who perform for the crowds, sometimes giving away candy, throwing confetti, setting off stink bombs, and (especially) smudging girls' faces. As a religious tradition, it is throughly confused. There are pagan elements mixed with Roman Catholic traditions mixed with modern aspects, apparently without any regard for signification. Parts of it are very faithful to tradition; other parts disregard any appeals to "authenticity."